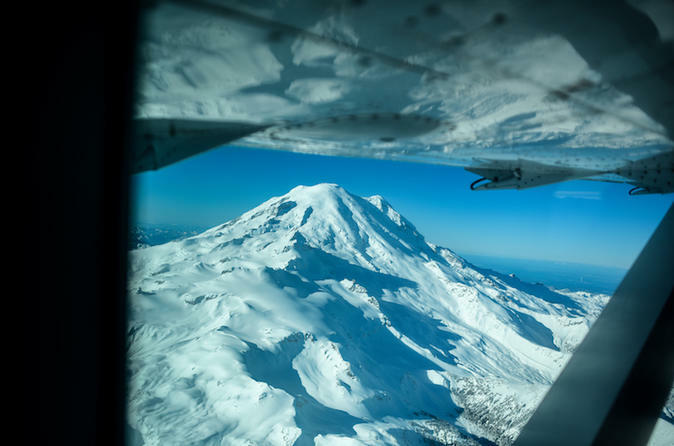 This incredible 90 minute scenic flight tour from Seattle flies you around Mount Rainier and Mount St. Helens getting you up close and personal with Rainier's 25 glaciers - the largest collection of permanent ice on a single US mountain south of Alaska. From your window aboard our 10-passenger Caravan wheel-plane, you'll also have the perfect vantage of Mount St. Helens' 2 mile wide crater. This incredible 90 minute scenic flight tour from Seattle flies you around Mount Rainier and Mount St. Helens getting you up close and personal with Rainier's 25 glaciers - the largest collection of permanent ice on a single US mountain south of Alaska. From your window seat aboard our 10-passenger Caravan wheel-plane you'll also have the perfect vantage of Mount St. Helens' 2 mile crater. Make sure to look closely...she's often steaming. Standing at a staggering 14,410 feet, Mount Rainier is the Pacific Northwest's reigning giant.